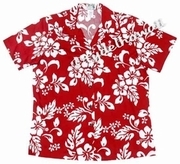 Women Hawaiian shirt, aloha lady shirt. Women Hawaiian Shirts are designed as Lady Aloha Shirts, there are 3" split on both sides at the bottom of shirts and the buttons of the shirts are brown coconut buttons, shirts are loose wear with tropical island theme. Great for luau, travel, cruise, work, uniform, party and casual wear.